There’s a food truck parked on Bascom Ave in San Jose that rarely moves. Thinking that a stationary food truck might be just the kind of place that would be the answer to my quest for the perfect torta, I stopped by after a bike ride. With no torta milanesa on the menu my eyes drifted elsewhere, and they settled upon the Pombazo Orginal. 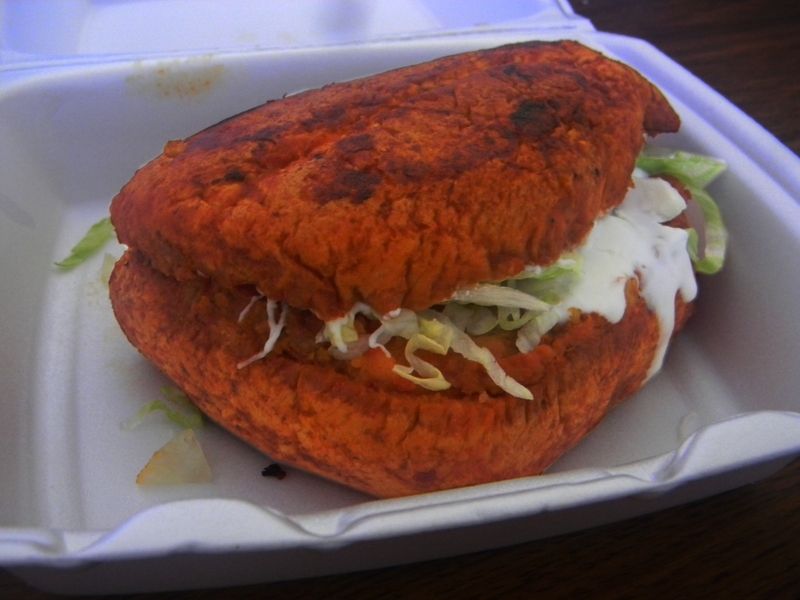 The Pambazo is another type of Mexican sandwich, named for the type of bread used. The bread is dipped in a red sauce, filled with potato, chorizo, lettuce, salsa, and queso fresco. Then the whole thing is browned on a flattop or in a skillet. The result is a delicious sandwich. Not one of those sandwiches where a hearty crust sends a tender filling sliding all over, the pombazo crust yields easily to give up the soft potato and chorizo filling. Everything is so soft that the iceberg lettuce, all too often an afterthought, provides a nice crisp contrast. There’s no great philosophy to lay out here, just a very tasty sandwich. Should you get the opportunity to eat a pombazo, my advice is that you take it. There will always be other tortas. This entry was posted in Sandwich Reviews and tagged Reviews by Pete, San Jose, Sandwiches I Have Eaten, Sandwiches Made For Me, Sausage by Pete. Bookmark the permalink.